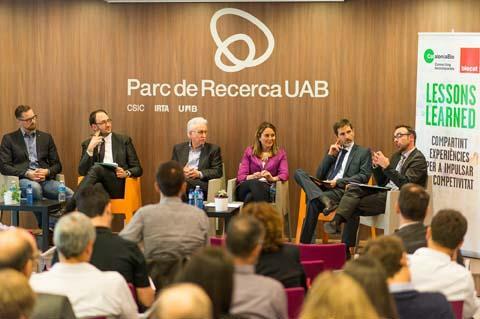 The CataloniaBio association of companies and Biocat organised the Lessons Learned. Medical devices: tips & tricks for managing the process of prototyping and validation forum held on 5 May at the UAB Research Park, where six leading companies in this field in Catalonia shared their experience: Specipig, Devicare, NEOS Surgery, usMIMA, Linking Innovations and the notified body BSI Group. The global medical device market will reach $440 billion by 2018, growing at about 4.4% per year, according to Fierce Medical Devices. For a product like this to reach the market, meaning patients, it is essential for it to address a real need and properly handle the prototyping and technical and clinical verification processes. One of the issues debated was whether in vivo tests are necessary for preclinical trials. Although they are not required under European regulations, “They are recommended as they provide real value to the company compared to tests done with artificial models, reduce the risk of the project and can help you attract investors and convince the market when you start commercializing the device," explained Jaume Amat, CEO of Specipig. Specipig is a CRO specialised in preclinical services with the swine model, which is currently working on validation of the Bitrack System surgical robot, among others. The model animal is selected depending on each project, but swine are being used more and more for their physiological similarity to the human body.